I love how this is a living work. If some detail is missed, even after… uh… publishing(? ), it can be addressed, unlike traditional media. I love it a lot too! One of my fav things about webcomics tbh… it is dynamic, and also I have a lot of time to consider pages before I have to think about printing. This part will definitely be much more fun to binge read. 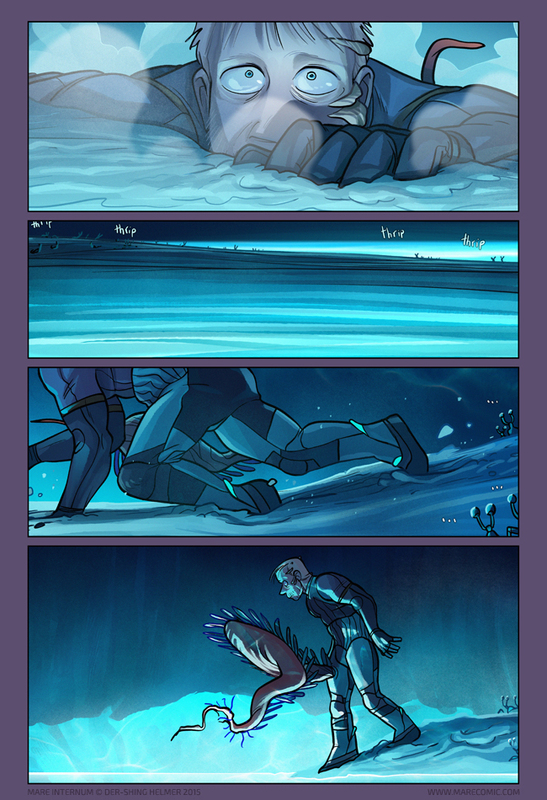 Oh I thought he had dropped into the water on the previous page. So is the ground like snow? Or clay/sediment? Are those little cricketcrabs there? the “antenna” seem like some kind of bug or crustacean sort of critter–the noise makes me think of crickets.. listen to the sound of crickets, it’s SO QUIET! Thighfriend to the rescue?? Mike sure makes a lot of friends where ever he goes! Look at all those adoring cricketcrab fans! What is it, thighfriend? You thirsty? There’s a creepy shadow behind us somewhere? Timmy fell into the well?? Is tighfriend self-inflatable? I don’t see another possible way to contain that much volume inside a functioning leg. …Is this why Mike’s eyes aren’t bloodshot anymore…? That one’s actually a bit more confusing. That type of hemorrhage stains the eye tissue and it takes a long, long time to go away even after the bleeding has stopped. It’s like a bruise. I haven’t worked out how that’s gotten healed so quickly yet, but I have a couple of ideas. Five words, buddy: “shing isn’t an eye doctor”. While I trust that you’re correct, I also believe it’s relatively obscure knowledge that shing wouldn’t even know to look up. Either that, or shing really, REALLY knows what they’re doing and has a complicated but legitimate explanation that will be provided in the comic or in the comments. thighfish and face fungus, look at how many friends we’re making!! sniff…I wish I had a thighfriend..sniff sniff. I have many thighfriends. On Earth we call them “cellulite”. Oh, so only the tip of tightfish was shrieveled. Der-Shing’s lighting has been masterful for as long as I’ve been reading her comics. I hope “thrip” does not mean “food”. Is he now breathing underwater (is it H2O?) through the thighfriend? …. Is thighfriend getting bigger? What if thighfriend is eating him? I mean we can’t be sure if thighfriend is a symbiot or a straight up parasite yet. If thighfriend’s a regular tapeworm-style parasite, then Mike should be fine, since hosts usually take a long time to die. Just pray there’s no wasp-style parasitoids in this ecosystem. Is that water?! Thighfriend wants in on that. He may double as leg straw! If the infecting agent is some kind of nanotech then all bets are off, of course. It all makes sense now: Klingons had head crab symbiotes introduced between The Original Series & The Next Generation. No wonder it’s a sensitive subject. I mean, given the circumstances…what else would you wanna do? I’d assume the sea is bioluminescent, but I wonder the “bio” part of that luminescence is. Plankton? Microbes? Martian fish-poo? Something underneath the sea? Also, I dig the cricketcrabs going all ellipsis after all their thripping. Love all the cricketcrabs just basically standing around watching Mike and going wtf? !